Lithographed by Henri Gillet 1854 (April-August): 5 c. brown, wmk. 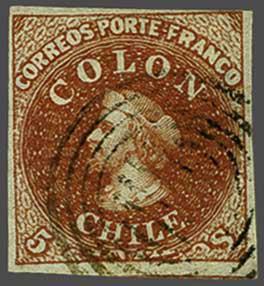 pos.2, a fine used example with clear to large margins all round and with portion of adjoining stamp at base, showing the marginal line watermark, with the dramatic Lithographic Transfer Flaw "Squeezed CENTAVOS" with just the 'S' of CENTAVOS showing at base (Blank 5/Vt 1/2) leaving the "Dwarf" stamp measuring 21 mm. instead of 23 mm., neatly cancelled in black leaving the variety clear. The rarest of all the Transfer Flaws on 'Centavos'. Illustrated in 'First Issue of Postage Stamps' by Gerhard Blank on plate 21. Exceptional and rare. Cert. BPA (1992) Gi. 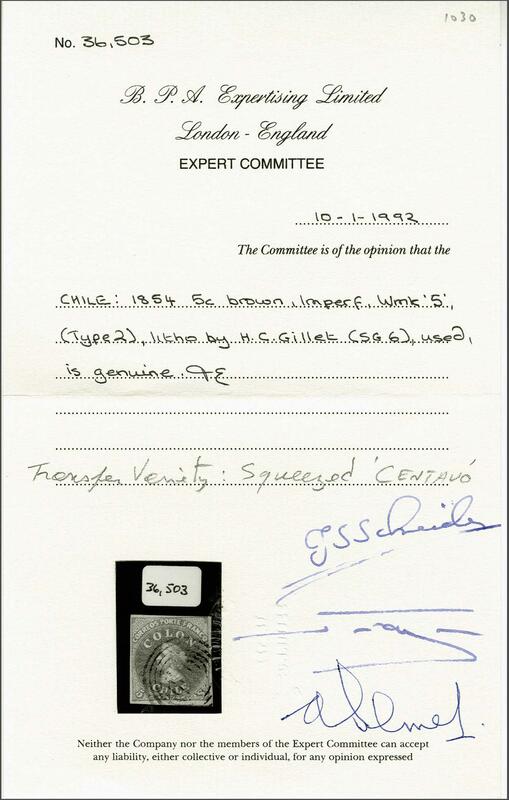 6 var.rnProvenance: Collection Count Welczek; Collection Gerhard Blank, RL, Dec 1991, lot 1030.